Walk Wade guide trips are a perfect starting point for beginner to experienced anglers looking to improve their skills. With a comfortable (3 to 1) client to guide ratio, and no “mixed parties”, you’ll be ensured to get the individualized personal attention you deserve. Let our certified Professional Guide Staff help you achieve fly fishing success on some of Colorado’s best trout fishing waters with seasoned, knowledgeable and friendly instruction under amazing Southwest Colorado mountain scenery. All our guided trips are conducted on rivers located within 1 hr. drive of Ridgway, Telluride, Ouray or Montrose Colorado. *All major airlines service Montrose Regional Airport, located 30 minutes from our Fly Shop. Walk wade trips are ideal for anglers of all ability levels. We offer convenient “drive to destinations” close to our Fly Shop, walk wade fly fishing trips have become a vacation favorite. Choose from half day, full day & multi-day walk wade fly fishing instruction on high county streams, tail-water & freestone rivers. Our SW Colorado fly fishing trips, plus Tenkara Guide Network Certified Guides on the Uncompahgre River, Gunnison River: Gunnison Gorge/Black Canyon, San Miguel River and the Cimarron River High Country are all available under RIGS own permits. We simply have the best permitted fly fishing access to quality Walk Wade & Float Fishing rivers in Southwest Colorado – no fish story. Why You Should Choose RIGS for your Walk Wade Fly Fishing Trip? We have guides for everyone – Beginner to experienced anglers looking to improve their skills. Client to Guide Ratio – We offer a low client to guide ratio with a maximum of 3 to 1 and no “mixed parties.” This way you’ll get the individualized personal attention you deserve. We have extensive access to everything from high county streams, tail-water year-round fishing, to wild freestone rivers. 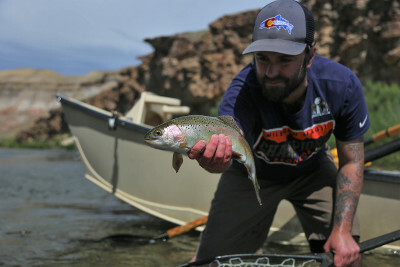 Our certified Professional Guide Staff can help you achieve fly fishing success on some of Colorado’s best trout fishing waters with seasoned, knowledgeable and friendly instruction. Choice – Half day, full day & multi-day trip formats. All rivers are located within an hour’s drive of the Fly Shop in Ridgway, Colorado. Learn a skill while on vacation – Walk Wade fly fishing trips have become a vacation favorite for everyone looking to learn more about our regional rivers. *Any additional items needed can be purchased prior to your trip at our Full Service Fly Shop. All rivers located within a one hour of Telluride, Ouray and Montrose Colorado. Directions to Fly Shop. *All major airlines service Montrose Regional Airport, located 30 minutes from our Fly Shop. Shuttle Services are also offered for personal vehicle transport on Lower Gunnison River (Gunnison Gorge / Black Canyon) trips. To help you plan your trip, we offer some great links to our Preferred Lodging Partners and Regional Information for Ouray, Telluride & Montrose Colorado. *Hunting & Fishing Licenses are available at RIGS Fly Shop. However, we encourage you to Purchase Fishing & Hunting Licenses Online prior to your trip to save time and hassle! *Walk Wade Fly Fishing Trip items can be purchased prior to your trip at our Full Service Fly Shop. Our staff specializes in teaching those new to the sport as well as improving existing knowledge in experienced anglers. 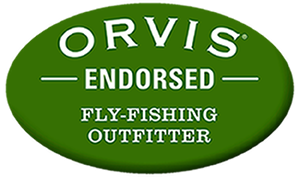 If you are interested in expanding your understanding of the sport of fly fishing the RIGS staff is ready to help. What is fly fishing? Fly fishing is a method of fishing where artificial "flies" or “invertebrates” are used to catch fish. Casting a fly requires a fly rod, reel, specialized weighted line and techniques that are significantly different from other forms of casting. Though fly fishing can be a complicated sport to learn and the terminology somewhat overwhelming; we are here to help you navigate the waters and explore the sport of fly fishing.